The Berkshire Downs are part of the North Wessex Downs Area of Outstanding Natural Beauty (AONB) which encompasses parts of Oxfordshire, Hampshire and Wltshire, as well as much of West Berkshire. The Berkshire Downs are mainly in western Berkshire but they extend westwards into Swindon and Wiltshire and north into southern Oxfordshire. The downland is part of the Southern England Chalk Formation which runs from Dorset in the west to Kent in the east. The northern edge of the Downs has the steeper scarp slope where there is a virtually continuous ridge of high ground, and this continues along the west edge of the Downs overlooking the Og Valley. This ridge is the route of The Ridgeway trail, the original route of which extends from Wiltshire to the River Thames at Goring Gap. South of this ridge the Downs are divided by the valley of the River Lambourn and the valleys of other small rivers and streams. The more open downland scenery is confined to the northern and central slopes, whereas in the south the hills are generally lower and gently undulating with areas of woodland. In the west the valley of the River Og, hardly more than a stream, separates the Berkshire Downs from the Marlborough Downs and in the east the valley of the River Thames separates the Downs from the Chiltern Hills. The picturesque Goring Gap, where the River Thames separates Streatley from Goring, is where the Downs and the Chilterns are at their closest. In the north the boundaries of the Downs have been assumed to be the A417 west of Moulsford and the B4507 west of Wantage, which coincide with much of the northern boundary of the area of outstanding natural beauty. The southern boundary is the valley of the River Kennet from Marlborough eastwards almost as far as Reading excluding the area around Theale as this is excluded from the AONB. The most notable rivers that originate and cut through the downs are the River Pang and the River Lambourn, both of which are little more than streams. 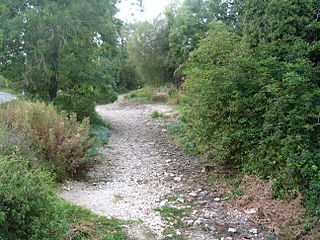 They are chalk streams and their upper reaches, together with their smaller tributaries, are winterbournes which means they are often dry in the summer when rainfall is low. The Pang's source is near the village of Compton and it flows for some for some 14 miles to join the River Thames at Pangbourne. 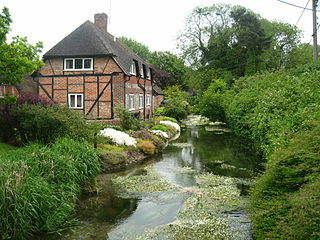 The source of the 16-mile long River Lambourn is close to Lambourn village high in the Downs and it joins the River Kennet at Newbury. 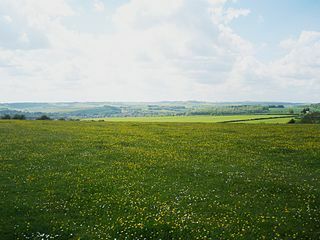 The downland pasture is firm and well drained, suited to grazing sheep and grazing and training horses. Sheep-grazing on the downs was once extensive and the village of East Ilsley once held an important weekly sheep market, the second largest in the country, and had claims on the title of sheep farming capital of England. 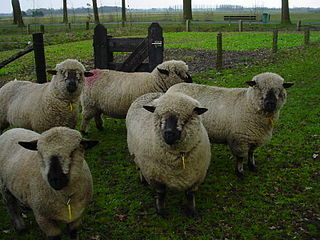 Berkshire once had its own breed of sheep, the Berkshire Nott Wether but the breed is now extinct and the Hampshire Down sheep is a direct descendant. Sheep grazing still continues in the Downs, but on a smaller scale and much of the land is nowadays given over to cereal production. Areas of woodland in the Downs tend to be small, unlike in the Chiltern Hills where beech woods were once important to the local economy. Horse racing is a major business in the Downs and several of the upland villages are home to major racing stables. In and around Lambourn, the most notable of these villages, there are over 1,000 horses in training, and over 50 racing yards. 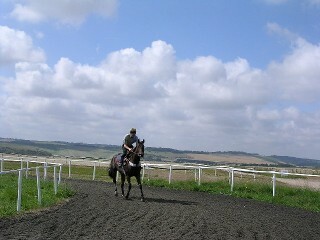 Much of the higher parts of the Downs, especially the Lambourn Downs, is made over to gallops and other training areas. The Lambourn Valley is one of the main training centres in England and is known as The Valley of the Racehorse. Racing stables are not confined to the Lambourn area however and elsewhere in the Downs there are several smaller establishments. In the Downs there are Neolithic, Bronze and Iron Age prehistoric sites, including the Wayland's Smithy, Uffington White Horse, Uffington Castle, Liddington Castle, Segsbury Camp, Grim's Ditch and numerous tumuli. 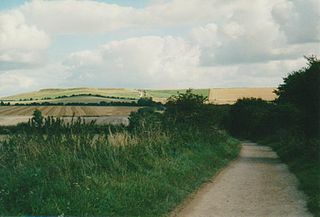 The Ridgeway, described as Britain's oldest road, is an ancient track which extends from Wiltshire along the ridge of the Berkshire Downs to the River Thames at Goring Gap. Now one of the country's National Trails, The Ridgeway trail now carries on across the Thames and follows the Chilterns to Ivinghoe Beacon in Buckinghamshire. The Ridgeway, looking eastwards, towards Uffington Castle ringfort.